Fathom Events and Rooster Teeth bring the premiere of Blood Fest to select movie theaters for an epic one-night event on August 14 featuring exclusive behind-the-scenes access to the film. 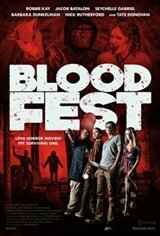 Described by Nightmare on Film Street as "an already wild party where someone has spiked the punch," Blood Fest follows fans who flock to a festival celebrating the most iconic horror movies, only to discover that the charismatic showman behind the event has a diabolical agenda. As festival attendees start dying off, three teenagers more schooled in horror-film clichés than knowledge about neutralizing psycho killers, must band together and battle through various madmen and monstrosities to survive.